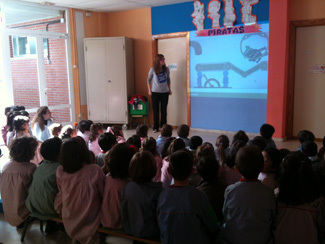 Humana took yesterday March 28th in a series of workshops on recycling sponsored by the Department of Environment of the Municipality of Collado Villalba (Madrid) in order to sensitize the school population about the importance of this concept. In total, five workshops on a total of 305 children aged 3 to 12 years and 15 teachers from the CEIP Daniel Vazquez Diaz. Together with the Foundation participated in the cycle Ecoembes, which focused on the recycling of packaging and Gave Vegetable Oil Management. Humana participation is part of the area of ? ?Education for Development Foundation. The textile recycling helps protect the environment by reducing in part the volume of waste generated by citizens, giving a second life to clothing that would otherwise go to landfill. With the reuse of clothing and footwear is achieved, also reduce the consumption of natural resources such as water or fossil fuels, as well as fertilizers and pesticides used in the manufacture of textiles. In addition, reusing or recycling textiles reduces CO2 emissions.